The 2019 Acura NSX will receive chassis upgrades, new tire specification and Sport Hybrid power unit tuning. The MSRP will not be changing from the previous model year with the starting price remaining at $189,900, and topping out at $242,000. New for 2019 is Thermal Orange Pearl premium paint which continues the tradition of NSX colour names inspired by motorsports race tracks and iconic corners. The Thermal Club is a racing facility near Palm Springs, California. Joining the Thermal Orange Pearl exterior, optional carbon ceramic metallic (CCM) brakes can now be fitted with orange calipers. New for 2019, the standard iron brakes can now be fitted with red calipers. All 2019 NSX models are distinguished by a new body-colour front grille garnish, which was previously silver, and high-gloss front grille surround, front air intake mesh and rear bumper outlet mesh. High-gloss treatment is also applied to the available Carbon Fiber Decklid Spoiler and Carbon Fiber Exterior Package, including a front chin spoiler, side sill garnish and rear diffuser. Power sport seats, previously a $1,800 option, are now standard. Lightweight manually adjustable sport seats, wrapped in Black Milano leather and Alcantara, are a no-cost option. Satellite-Linked Navigation, ELS Studio premium audio, front and rear proximity sensors and aluminum sport pedals, previously optional equipment, are also now standard. 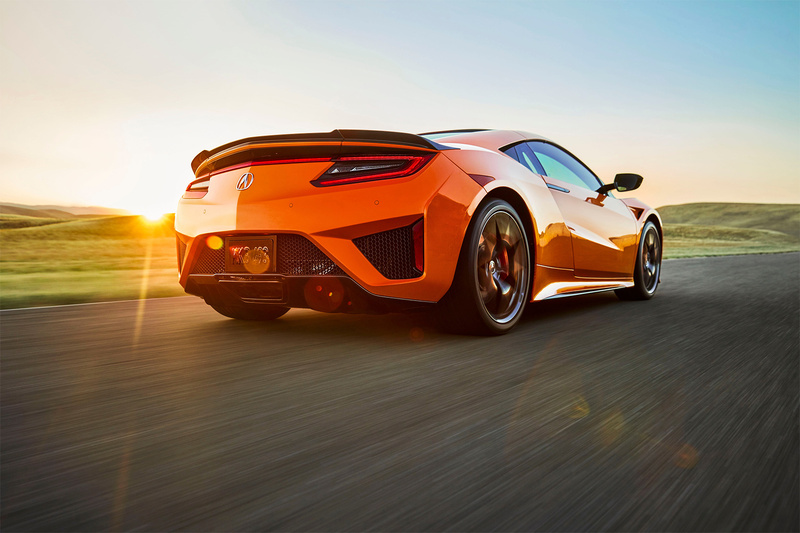 For the 2019 model, engineers modified chassis components, tires and software tuning to make NSX even more responsive, both on the road and on the track. 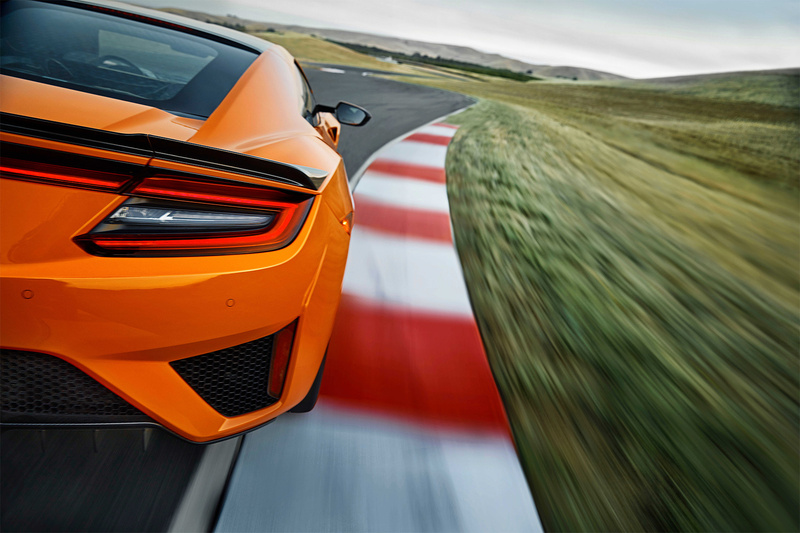 At the limit, the NSX’s balance and controllability has improved, allowing the driver to more precisely modulate understeer and oversteer with subtle throttle inputs. The changes resulted in a nearly 2-second faster lap time in testing around the Suzuka Circuit in Japan. Chassis enhancements include larger front and rear stabilizer bars and 21 percent stiffer rear toe link bushings. Rear hub rigidity has increased 6 percent. 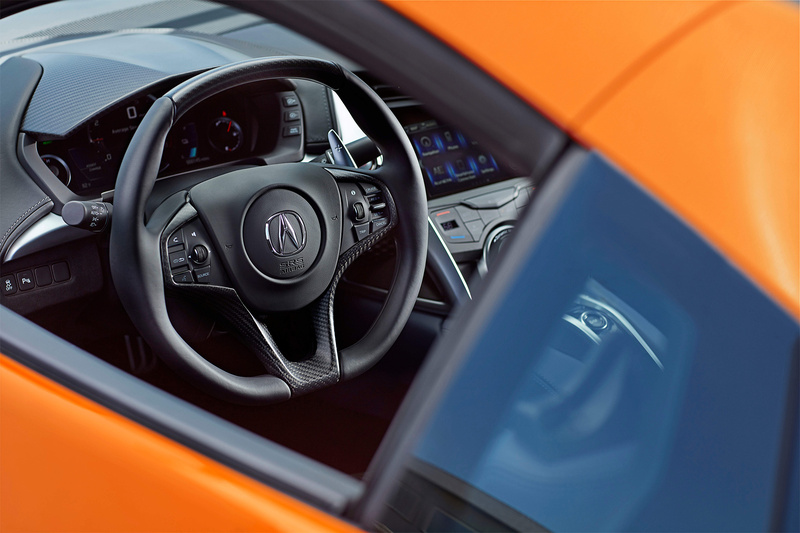 Software calibrations to the NSX’s Sport Hybrid SH-AWD power unit, active magnetorheological dampers, electric power steering and VSA settings capitalize on this new hardware, as well as the grippier tire setup. The 2019 NSX rides on new Continental SportContact 6 tires, developed exclusively for the NSX. The new tires feature a revised tread pattern, construction and rubber compound for improved handling performance in all conditions, from daily commuting to track use, including wet weather driving. The track-focused Pirelli P Zero Trofeo R remains an optional dealer-installed tire. 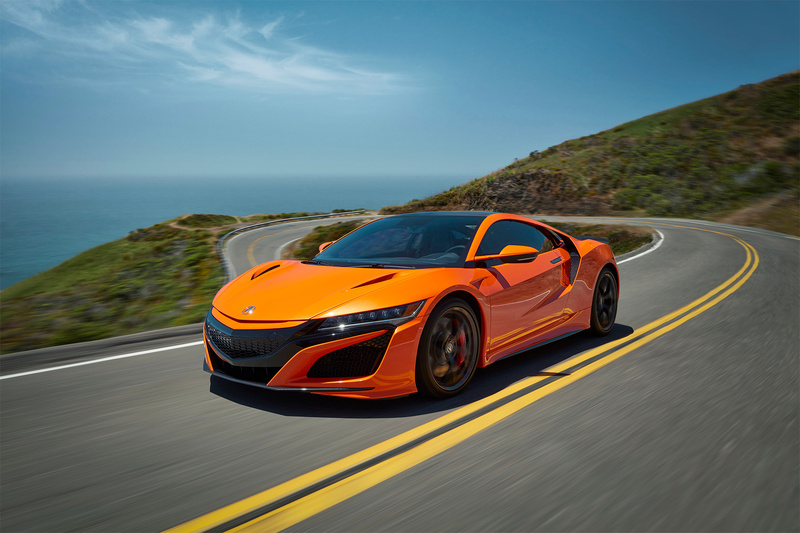 The 2019 NSX is powered by a Sport Hybrid SH-AWD power unit consisting of a twin-turbocharged mid‑mounted V6 engine paired with a 9-speed dual clutch transmission (9DCT). An electric Direct Drive Motor integrated with the engine and 9DCT supplements the engine with instantaneous electric torque. Containing two additional electric motors, the front-mounted Twin Motor Unit (TMU) continuously varies torque to the left and right front wheels to enhance handling precision and cornering capabilities, elevating any driver’s confidence and performance. Maximum peak system output is 573 horsepower and 476 lb.-ft. of torque. The NSX’s Integrated Dynamics System, with Quiet, Sport, Sport+ and Track modes, provides a wider range of driving experiences. The NSX features an advanced, multi-material body and aluminum-intensive space frame with the world’s first application of aluminum ablation casting in the space frame structure, enabling ultra-high rigidity, compact packaging and outstanding collision safety performance. All new NSX owners have the opportunity to join the NSX Insider Experience, a personalized program that allows NSX owners to participate in the making of their supercar. 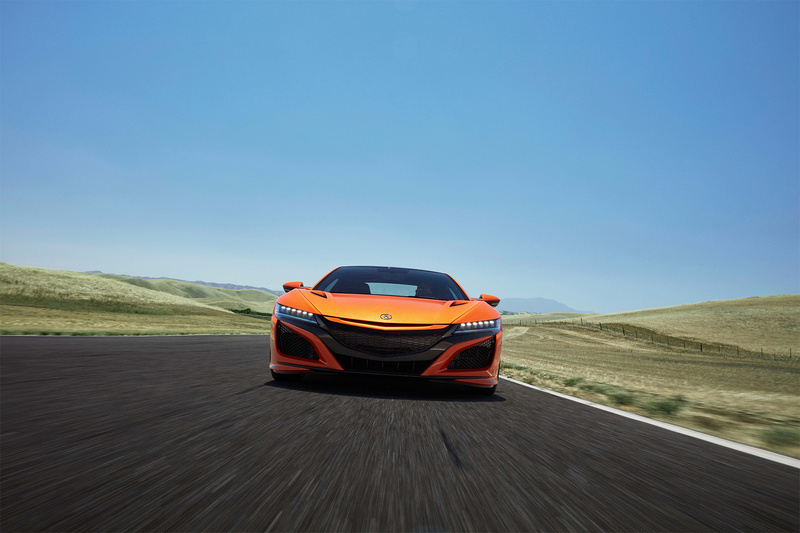 The program offers a curated, one-on-one tour of key Acura facilities across Ohio, including the Performance Manufacturing Center (PMC), where the NSX is built, and the NSX engine assembly room at the Anna Engine Plant. Guests also have the opportunity to track an NSX, guided by a professional driver, on one of the primary proving grounds where it was developed and tuned, the Transportation Research Center (TRC). The NSX Insider Experience is offered in six distinct packages with one and two-day tour options, which can be customized to include a tour of the Anna Engine Plant in addition to the tour of the PMC. Additional options include a two or four-hour performance driving experience at the Acura Proving Grounds, as well as a tour of the Honda Heritage Center. Based on the NSX road car and utilizing its twin-turbocharged V6 powerplant and multi-material space frame, the NSX GT3 race car has already taken multiple poles, checkered flags and podiums, including consecutive wins on the streets of Belle Isle in Detroit in 2017 and 2018. The race-winning, carbon fiber NSX GT3 is offered for sale globally at a starting price of 465,000 Euros, or roughly CAD $690,000. Available for customer purchase since July 2017, the NSX GT3 is now in the hands of both professional and amateur racers globally, and certified to compete in more than a dozen FIA-sanctioned racing series around the world.